Please note that the maximum quantity we can supply of this product is 48. This gentle organic formula is specially formulated using only the finest organic milk and contains Omega 3 & 6 LCPs (DHA & AA) and PRÆBIOTIK® oligosaccharides (GOS), as well as all the important vitamins, minerals and other nutrients (required by law) that babies need to grow strong and healthy. 1. Wash hands and sterilise all equipment following the manufacturer's instructions. 2. Ensure top of carton is clean and check BBE date. Shake well and cut open where indicated using a pair of scissors. 3. Pour required amount of milk into a sterilised bottle. 4. 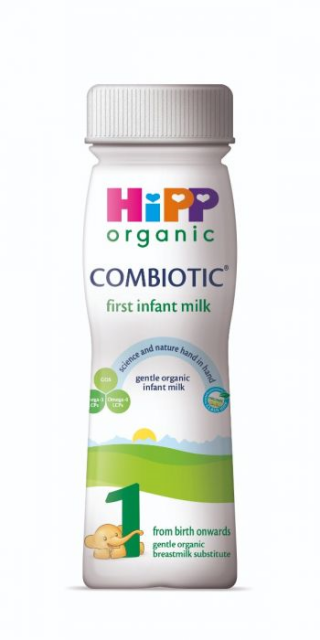 HiPP Organic first infant milk can be given at room temperature or warmed if desired. If warmed check temperature before feeding. 5. For hygiene reasons discard unfinished feed in bottle as soon as possible and always within 2 hours. Do not heat feeds in a microwave, hot spots may occur which could cause scalding. A responsible person should be with your baby during feeding. Clean your baby's teeth regularly and introduce a cup or beaker as soon as possible to prevent prolonged/frequent contact of teeth with milk feeds which may increase the risk of tooth decay. Unused feed in carton should be refrigerated immediately (at about 4-6øC) and used within 24 hours. Breastfeeding is best for babies. It is recommended that HiPP Organic first infant milk is only used on the advice of a doctor, midwife, healthy visitor, public health nurse, dietitian or pharmacist.